Vegan Diner by Julie Hasson is a must have book for any kitchen. It contains within beautiful, glossy pages several of my 'best of' recipes, including mac and cheese, BBQ sauce, ribs, beer bread and chocolate chip cookies. If you don't have this book, you should go get is straight away! Let us now see some of the tasty treats I have made! 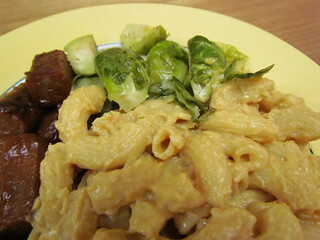 Cheezy Mac and Garlic-Roasted Brussels Sprouts: I cannot say enough how amazing this mac and cheese is, it is perfect smoky, cheesy deliciousness. The variation of stirring through some grated cheese (I used cheezly) leads to an extra rich sauce, though even without it this is amazing. James recommended that I add a few drops of umeboshi plum vinegar, which makes it extra special. The Brussels sprouts have raw garlic sprinkled on at the end, but I prefer to add the garlic in the last five minutes of baking. (If you are wondering, they are some steak-sauce glazed sliced Sanitarium sausages on the side of the plate). 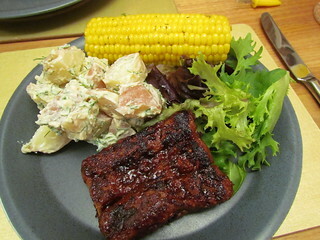 Barbecued Ribz with Garlic-Dill Potato Salad: These ribs come together so effortlessly, plus they contain peanut butter! After baking, the ribs are brushed with Rough Rider Barbecue Sauce (aka the BEST BBQ sauce in the world). You are meant to finish the ribs off in a grill pan, which I don't have, but they are still amazing done in a frying pan. These are soooo good! The BBQ sauce takes a little bit of time to simmer on the stove, but it comes together super easily and is worth it. The garlic and dill potato salad is coated in a delicious, tofu-based Homemade Garlic Mayo (if you have a chance, let it sit for a bit, the flavours really mellow and mingle!). This salad is super garlicky and super dilly - yum! 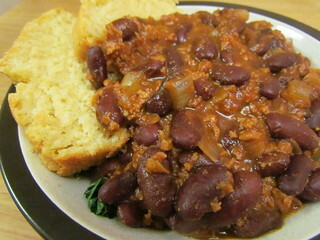 Quick and Hearty Chili and Sweet Cornbread: This chili lives up to its name - it comes together very easily and the combination of TVP and red kidney beans makes it very hearty! It has a lovely savoury flavor, which includes cocoa powder. I took the option of reducing the sugar in the cornbread, and it was still pretty sweet, but went nicely with chili. 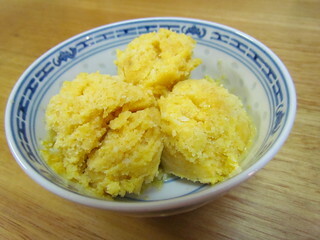 It is a very simple recipe. 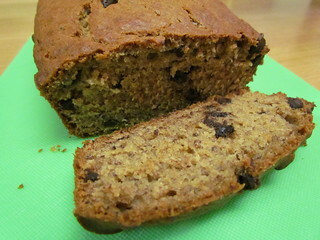 Banana Chocolate Chip Bread: It is rare that bananas get a chance to get ripe in this household (my dad is a banana addict), but when they do I jump at the chance to make baked goods. This recipe smells great and tastes even better! Biscuits and Creamy Sage Gravy: Biscuits and gravy are not something that is part of my Australian upbringing, so thanks America for introducing me to this! American gravy also tends to be a bit different, more creamy. This gravy is laced with nooch and ground sage. The Fluffy Biscuits come together easily and are super cute! 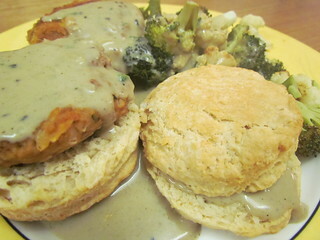 I served these with the Tempeh and White Bean Sausage Patties from VWAV. Garlic Dill Bread: I have made this so many times, it is so good! 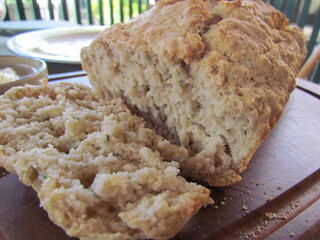 It is a beer bread, and I normally use a Cooper's Pale Ale for this because it is nice and mild in flavour. 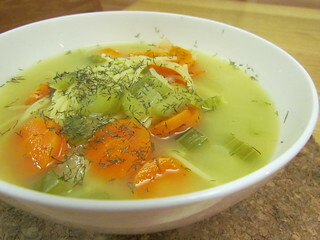 Adorably, this recipe calls for 2 tablespoons of chipped dill, but I add in as much as I can! Home-Style Veggie Noodle Soup: This is simple and classic, carrts and celery in a noochy chicken-style broth with spaghetti. Great for a quick dinner on a cold night. 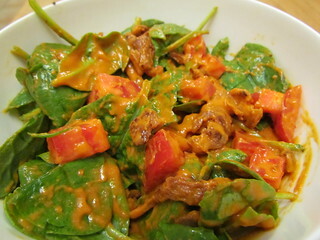 Smoky Spinach and Tomato Salad: This involves a few components, including Smoky Curls (see below) and a Creamy Tomato Dressing, but once you have these it comes together in a snap. It has such lovely flavours. The dressing is nice and thick, with an unexpected smoky flavour. 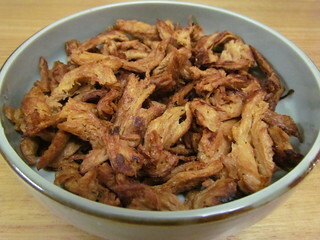 Smoky Soy Curls: We don't have soy curls themselves here, but we have similar products. Though I made this with actual Soy Curls that I brought home from the USA. This recipe is easy and creates a delicious, snackable end product. 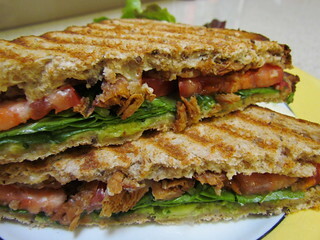 They are are the star of the salad above, but can be used in so many other ways, such as this BLT-style sandwich! Sahara loves broccoli! Sadly she can't have it anymore because she has inflammatory bowel disease, which is managed with medication and a very strict, very non-vegan diet. But this photo was taken in other times, when she could sample the wares. 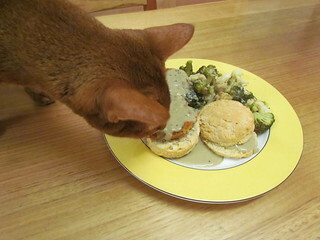 The broccoli lured her up to the table, but she was also very interested in the gravy! A blanket announcement: Anytime a chocolate recipe calls for almond extract, I never add it (unless it is meant to be a chocolate almond flavour specifically). I don't know if almond extract in the US is different from almond extract here, but it just makes everything taste like marzipan. And I like marzipan, but not in everything! I normally just use more vanilla unless there is another flavour option listed in the recipe. 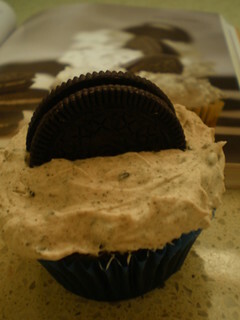 Cookies and Cream Cupcakes: This is a variation of Your Basic Chocolate Cupcake. I used Oreos (Newman-O's don't exist here, and Oreos are vegan in Australia), which are added chopping into the batter, ground into the buttercream frosting on top and used as decoration. 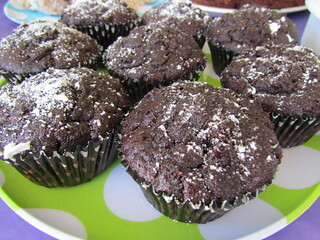 Chocolate-Chocolate Gluten Freedom Cupcakes: Yay for gluten free cupcakes for all the lovely gleegans in my life! 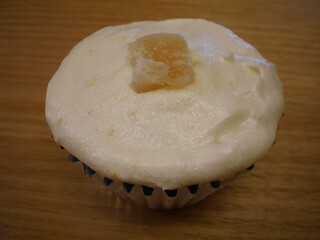 These cupcakes are quite a bit denser than non-gluten free cupcakes, but are still moist. Just don't be tempted to lick the beaters because raw gf batter is icky! But they bake up into tasty treats. 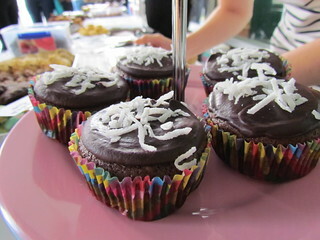 Here they are topped with chocolate buttercream, shaved white chocolate and chocolate sprinkles. Gluten-Free Peanut Butter Bombes: Any of the regular vanilla or chocolate cupcake variations can be adapted for the gluten free ones. 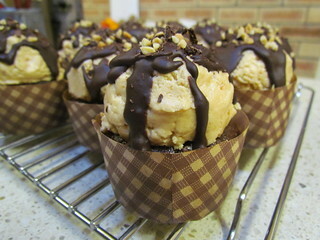 Chocolate cupcakes are piled high Peanut Butter Frosting, drizzled with chocolate ganache and decorated with chopped peanuts. 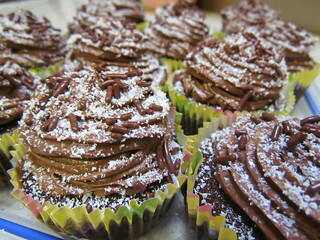 Chocolate Coconut Gluten Freedom Cupcakes: For this recipe I replaced the soy milk in the cupcake batter with coconut milk, as well as adding some coconut extract. They are topped with ganache, which was also made with coconut milk instead of soy milk, then I just sprinkled some sweetened shredded coconut on top. 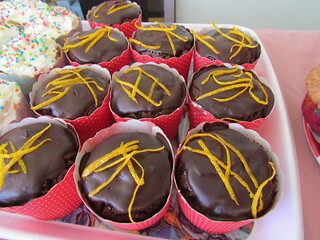 Chocolate-Orange Gluten Freedom Cupcakes: Yes, another chocolate cupcake variation. When I do bake sales, I tend to always try and take one sort of GF cupcake, so I have made a few variations over the months. In this case I added orange essence to the batter and to the ganache, then topped with orange rind right before serving. Carrot Cake Cupcakes with Cream Cheese Frosting: I love carrot cake, and these are some cute little carroty cupcakes (despite the terrible photo). As well as carrots they have raisins and walnuts. I find the actual cream cheese frosting in this book insanely sweet and unpleasant, I much prefer the one from Joy Of Vegan Baking. Gingerbread Cupcakes with Lemony Frosting: We don't have 'light' molasses here, so normally I use either treacle if I have it or a blend of blackstrap and golden syrup. For these I just used straight up blackstrap. It gave it a stronger taste and a darker colour, but I love blackstrap molasses! There is the option to top these with lemony cream cheese frosting or lemony butter cream. I used the cream cheese frosting (I made them with the carrot cake cupcakes above, so I flavoured half the frosting with lemon for these. Crimson Velveteen Cupcakes with Old-Fashioned Velvet Icing: Red Velvet isn't a thing in Australia, so I never really new what to expect. These have a hefty dose of red food colouring in them, so of course I made them to take to a two year old's birthday party! Artificial petrochemical colouring all the way, baby. ;) It was basically a really nice chocolate cupcake, enhanced by the chocolate extract I recently procured, it didn't taste particularly 'red'. The old fashioned icing is lovely, kind of custardy. Chocolate Stout Cupcakes: I normally don't like stout in things, I find the taste too overpowering, but in this recipe it is just enough to add a nice depth. I used muffin cups, which were a bit later than cupcake ones, and filled to 3/4 full I got eight and a half, but the rose a lot. You need to be careful with the crumb topping, it says to use 2 tablespoons of oil but it very quickly turns into sludge with this amount! 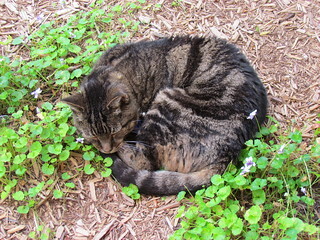 A year today since Possum passed away. We miss him. Vegan Cooking for One by Leah Leneman is a book I've had for a while, though I resisted buying it due to the title even when I was living on my own. It consists of weekly menus that make use of part tins or part blocks of ingredients for each recipe, so over the course of a week you use up everything and don't have bits and pieces going off in the fridge. It gives you a shopping list at the beginning of each week. The serving sizes tend to be quite generous. 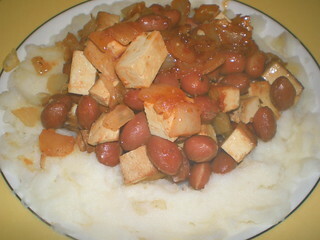 Smoky Beans: The smoky in these comes from using smoked tofu, rather than using liquid smoke or smoked paprika. It is has apple juice in the recipe, which makes it fairly sweet. It is served over mashed potatoes, which is always good. 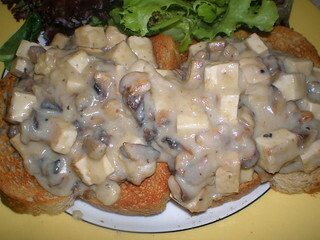 Smoked Tofu a la Kind: Smoked tofu and mushrooms in a creamy sauce (based on a roux) and served on toast? Yes! I would consider this more a lunch dish than a dinner dish. I left out the capsicum. Creamy Curried Mushrooms with Bulgur Wheat: I scaled this a little by using less bulgur (1/4 cup rather than just over 1/3) and usingmore mushrooms and onions. This was back in a time when I couldn't get plain soy yoghurt at all, so I used sour cream instead. It is quite rich. Gooseberry Dessert: I found some gooseberries randomly, so seemed like a good time to try this dessert, also made with semolina. 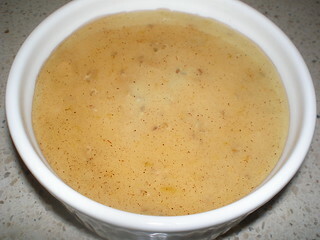 It is quite tart, it says to add sugar to taste and I added a tablespoon. The gooseberries cook quickly. It is nice with some sort of maple syrup or agave on top. Lentil and Vegetable Pottage: This recipe makes a larger than usual amount for this book! 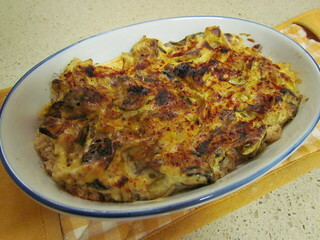 It is a bit on the bland side, but is still nicely comforting. 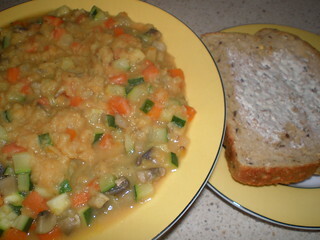 Lentils, onions, garlic, zucchini, carrot and mushrooms, served with some bread and Nuttelex. 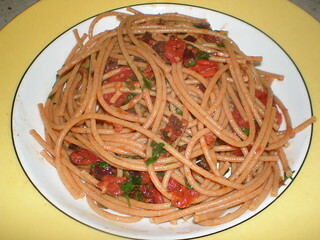 Spaghetti with Sun-Dried Tomatoes: This is kind of bland and a little dry, adding extra olives helped. It would be nice with some baked tofu added, and lots of salad. 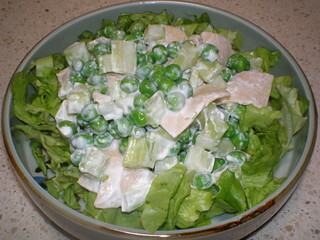 'Chicken' Salad: This is a light lunch, combining peas, 'chicken' slices and celery in a mayo and sour cream dressing served over lettuce. I used Redwoods Cheatin' Chicken Slices. 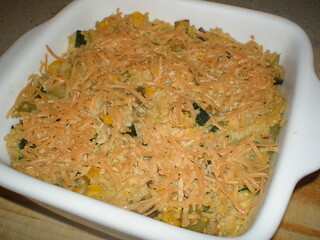 Millet and Vegetable Gratin: This made a huge amount! The recipe called for 1/2 cup of millet, I used 1/3 of a cup, but for one person probably just 1/4 cup would be fine once it is mixed up with al the vegetables and baked. I used some Cheezly on top for the cheese. 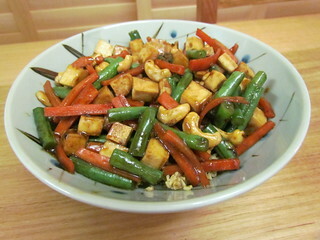 Tofu with Cashews and Vegetables: Simple, fast and tasty, this has a teriyaki kind of sauce to it. Served over brown rice and topped with roasted cashews. 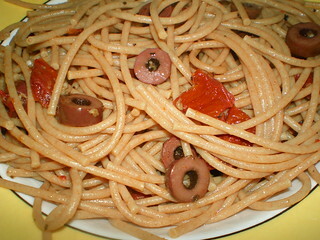 Spaghetti with Olive Sauce: As always, more olives are needed! This didn't dry out like the other pasta dish above did, and the fresh tomatoes cooked down into quite a nice sauce. 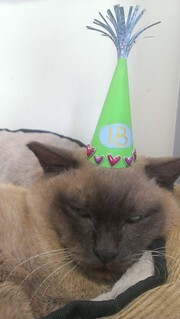 Speaking of kitty birthdays, our gorgeous clinic kitty Abbey turned 18 on Saturday (she's a Valentine's day baby). To celebrate, one of our nurses made this adorable 18th birthday hat for her. Isn't it fetching? You can't see it too well here, but the green matches her beautiful eyes! 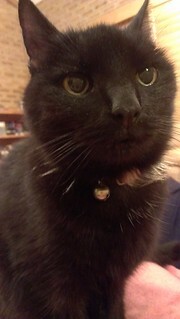 Dim Sim turned fifteen today! I am not sure where all the time has gone, since she first came to me as a tiny six week old kitty who could fit in my hand. She is still pretty tiny for a kitty! 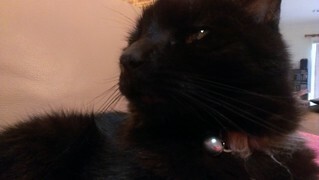 She has recently been diagnosed with early kidney disease, which breaks my heart somewhat, though it doesn't seem to be bothering her. 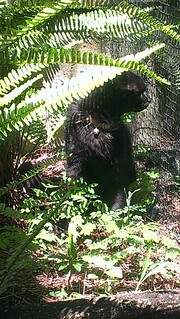 Anyway, black kitty birthday photos! This is from last night - a last 14 year old birthday photo! And now onto some birthday day photos! 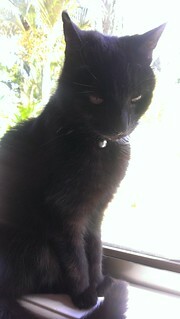 Sitting on the windowsill in the sun room. 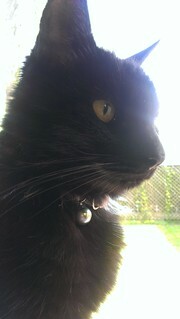 Enjoying some sun out in the catmax. She actually spent most of the day out there, and only came in this afternoon. 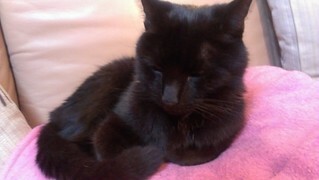 And settling in for the afternoon on her pink snuggie on the sofa. It was originally meant to be my pink snuggie, but I think she claimed it as her own within days of it arriving in the house a few years ago. I love making menus from books, and I love alliteration! The Vegan Table by Colleen Patrick-Goudreau is a book full of menu plans. I made the Curry in a Hurry menu last year for Father's Day, because my dad loves all things Indian. To be honest, sometimes the menus in this book seem a little disjointed, but this is relatively simple and goes together very nicely. This menu is from the 'Formal Dining for Six to Ten' chapter and is the 'Summer' section (I did not actually make this in summer, which is pretty shocking for me). Pumpkin Curry: I only made a half batch of this (as I was cooking for three). 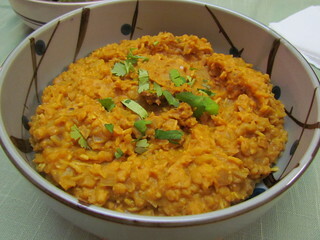 This uses lentils, onions, pumpkin purees, shredded coconut and spices. Because I am a chili wimp, I used one dried chili instead of five. I needed to increase the heat and cover for the last 10 minutes of cooking to get the lentils to cook all the way through. I also changed the water to vegetable stock for some more flavour. 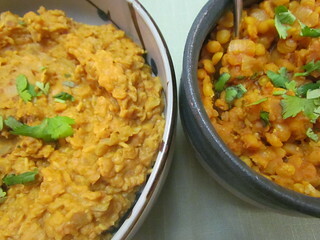 Yellow Split Pea Dal: I made the whole recipe of this, which made an okay amount, but if I broke this into the 6 servings it said it makes they would be pretty small. 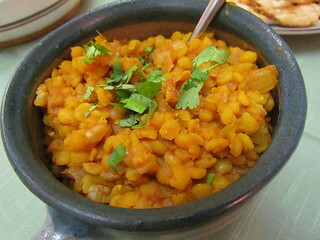 I love dal, and this was nice and satisfying, though not the best dal I've made. Looking nice and tasty together! 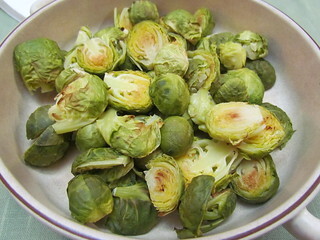 This menu doesn't have anything green or really many vegetables at all, so I roasted a bunch of Brussels Sprouts to go on the side. Curried Puff Pastry Nibbles from Quick-Fix Vegan by Robin Robertson: This is a ring-in. 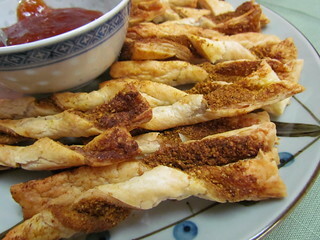 I wanted something a little extra as the menu itself was fairly simple, so I picked these cute curried puff pastry twists. Ready-made puff pastry is pressed with a mixture of ground cashews and spices, then baked. I found they turned out a little dry, but nothing some mango chutney couldn't fix. 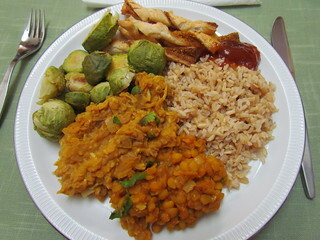 I served all of this with some brown basmati rice for a very tasty plate. 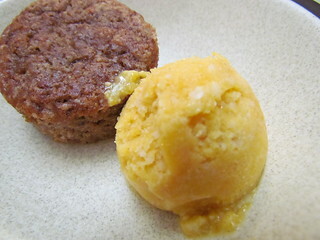 Frozen Mango Lassi: Of course we had to end with dessert. This menu ends with a frozen mango lassi, made mango, yoghurt, agave and cardamom. The mango and the yoghurt need to be frozen first, and because it was not mango season I just used a bag of frozen mango I always have on-hand for smoothies. This made quite a large amount. 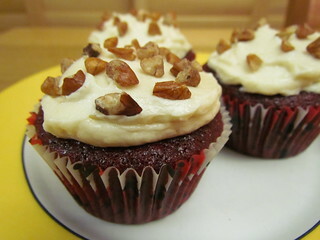 On the night I served it with some strawberry cupcakes (from Colleen's other book The Joy of Vegan Baking). Remember Honey from my last post? 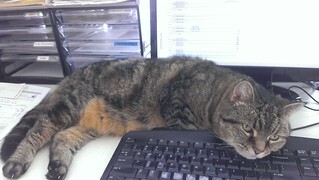 Here she is helping me out at work by lying on the keyboard. MOAR cookies! 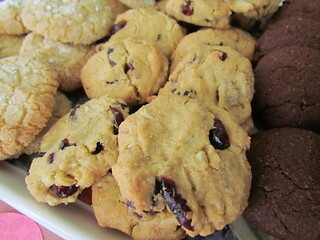 This time from Vegan Cookies Invade Your Cookie Jar by Isa Chandra Moskowitz and Terry Hope Romero. Let's dig in. 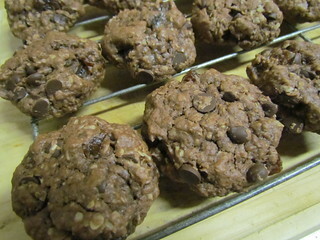 Chocolate Fudgy Oatmeal Cookies: I made these as a get better gift, and they were a huge success. Oats, chocolate chip and dried fruit (I used raisins) are mixed into a rich, chocolatey dough. The recipe said it made two and a half dozen, I made a half batch and got 19 cookies using an Australian tablespoon as the cookie scoop. 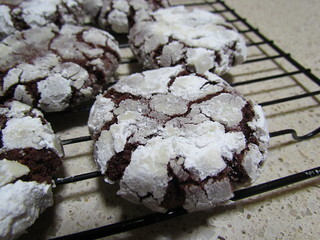 Chocolatey Crinkle Cookies: These are AMAZING. Like a cookie and a brownie had a baby! The rolled around in a sugary snow. Do I need to say anymore? I think not. Tahini Lime Cookies (GF variation): One of the great things about this book as that they include their own GF flour mix, which you can use in almost any of their recipes (they give instructions for adjusting the ratio as well). 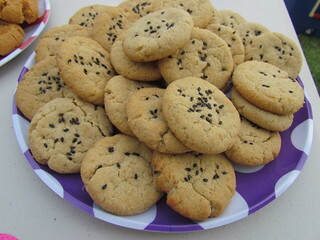 These tahini and lime cookies are an unusual combination, but are very nice, though they did turn out a little dry. Yes, that does appear to be some cat fur on a cookie. Cranberry Almond Cookies: These were meant to be Cherry Almond Cookies, which I would have preferred, but dried cherries are insanely expensive and hard to find around my parts. They still worked out very nice with cranberries! 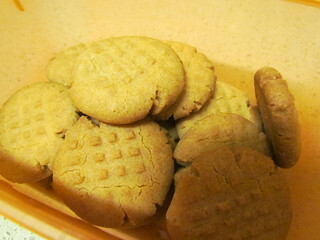 Peanut Butter Crisscrosses: Classic peanut butter cookies. I made a half batch and they made about 15 smallish cookies (the full recipe says it makes 2 dozen). 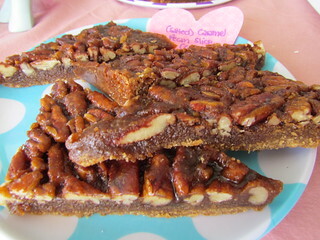 Caramel Pecan Bars (with Salted Variation): This is very sweet and very sticky, and is also quite popular at bake sales. 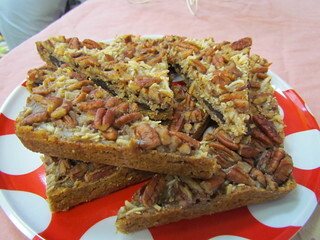 It makes a big pan (9 x 13 inch) of bars so it is easy to make half regular and half as the salted variation (which just involves sprinkling fleur de sel on the hot bars when they are out of the oven). Magical Coconut Cookie Bars: These are amazing, sweet and delicious. A digestive biscuit crust (because we don't have graham crackers here) with coconut caramel and then topped with chocolate chips, flaked coconut and pecans. So yum! 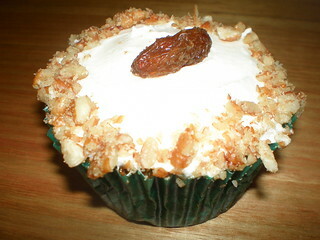 I actually ended up using coconut cream because I had some left over rather than coconut milk, which worked fine. 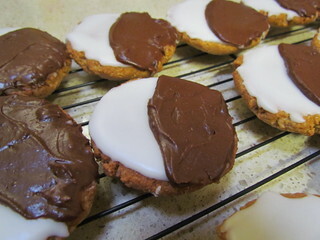 NYC Black and White Cookies (GF variation): The cookies didn't spread very much on their own, I had to push them down so they didn't turn out like scones, I am not sure if that is due to the GF version or if that is something that would happen with the regular one as well. Anyway, they turned out quite a bit thicker than I expected. The icing is very, very sweet. 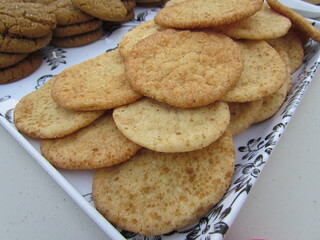 Ooh La Las (GF variation): Many of these cookies I have made for bake sales or similar events. 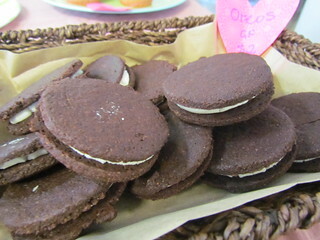 One bake sale I made some gluten free vegan oreos and everyone was happy! The GF variation worked really well here, and they turned out very tasty and very cute. I made a half batch, which made 18 cookies. I have yet to be able to find black cocoa, so I just used regular cocoa. The filling was quite remarkable, as it did turn into that sort of dry but sticky filling exactly like what is in an oreo! Honey is a kitty who comes into boarding sometimes, I think I have posted her photo before, she loves to lie flat on her back with her belly in the air. 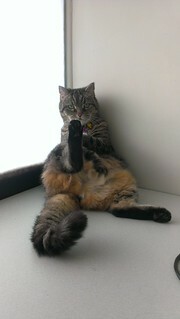 This time, she also adopted this graceful pose, which apparently is the best way to groom your back legs!